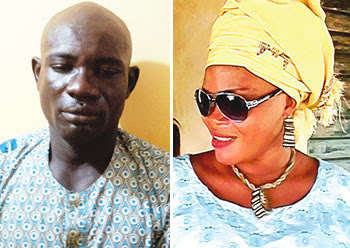 A welder ,Marufu Olasoji, has beaten his wife, Kehinde Olasoji, to death for allegedly committing adultery.It was learnt that the 35-year-old welder repeatedly hit the wife’s head with an iron until she gave up the ghost. He was said to have sprayed cement on her face and fled the neighbourhood, leaving her in a pool of blood. The incident happened around 8pm on Monday at the Chelsea neighbourhood of the Sango-Ota area. PUNCH Metro gathered that Marufu had turned Kehinde, a hairdresser, who had three children for him, to a punch bag while their 15-year relationship lasted. Our correspondent was told that the wife, aged 35, left the welder with her children three months ago when she could no longer endure the assault. On the fateful day, she was said to have been invited by the suspect, who reportedly accused her of having extra-marital affairs. The accusation was said to have led to an altercation which led to Kehinde’s death. It was learnt that policemen from the Onipanu Police Division, Ogun State, launched a manhunt for the husband after a neighbour reported the case at the station. He was eventually arrested around 6am on Tuesday. The suspect told our correspondent that his late wife had come to collect a sum of N17,000 to buy a dryer when an argument ensued. He said he fled out of fear, adding that he really loved her. “I promised to buy her a dryer before she moved out. She called me around 7.30pm on Monday that she wanted to collect the N17,000 for the dryer. I told her to give me more time. She insisted she must have the money and started dragging my shirt. I just pulled her hands off, but unfortunately she fell and hit her head on some objects inside my room. “When I observed that she was dead, I drank the cement but I later vomited it on her body. But the deceased’s twin sister, Taiye, said Kehinde was not in need of any dryer. She said frequent assaults forced her sister to leave the suspect. Amidst tears, Taiye said the sister had just helped her to make her hair before she left home on the fateful day, adding that it was the only time she would leave home without telling her. “He was telling lies. She did not need any dryer. I gave her mine when I quit hairdressing. Who will I be talking to now? Is it by force to marry a man? What could she have done to warrant being beaten to death? “He always beat her and most times, it was in the night. There was a time she called our parents around 11pm that Daddy Mariam (Marufu) was beating her. She was nursing a baby then. When my brothers and I got there, we saw a big stick in his hand with which he had inflicted injuries on her body. A police source told our correspondent that the suspect would soon be transferred to the state police command in Eleweran.